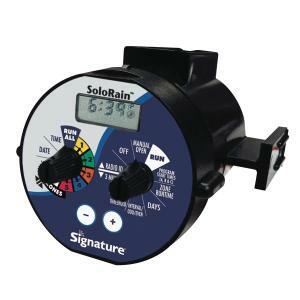 The Signature SoloRain 8020 Series battery operated controller is available in four zone model. Controller operates three independent programs. The waterproof design allows this controller to be submerged in up to 6' of water. Designed to install on any Signature Turf valve and can be fitted to many other valves by using adapters. Can have a maximum length of 250’ of 18 AWG direct burial wire between the controller and the DC solenoid. All models are designed to accommodate normally closed rain, freeze or event sensors.